Isomatic designs and manufactures Medium Frequency resistance welding transformers (1000 Hz square wave input, DC output) in ISO H size integrated transgun style, supplementing the 50/60 Hz range. For enquiries for medium frequency transformers: E-mail by clicking including delivery location so we can use an appropriate currency and estimate transport costs. Fast and convenient disassembly of the rectifier assembly. Water cooled rectifier and transformer secondary. Compatible with the forthcoming International Standard, currently ISO CD 22829. Prospective Customers can E-mail Isomatic by clicking on the Logo panel at the top of this page. 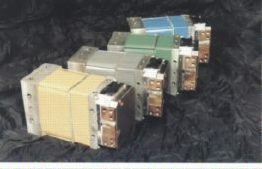 Medium-frequency (MF) transformers are a result of recent advances in resistance welding technology. They are powered by a transistor inverter, supplying square wave AC 500 V @ 1000 Hz which is converted by the MF transformer to a low voltage high current AC. This low voltage AC current is rectified to DC by a diode block built into the transformer. The reactance of the welding loop only limits the upslope and downslope of the welding current, while the peak welding current in limited only by the welding loops resistance. The net result is again smaller transformer, especially when welding with large throat, high-impedance guns. MF welding is less demanding on the plant power system. The MF inverter draws balanced line current from all 3 phases and operates at a high power factor (0.9). With MF transformers the peak welding current almost equals its RMS value, which helps to obtain quality welds with no splash and constant strength even at lower pressure. The high frequency permits much faster  1000 times per second - process control, which again results in better weld quality. The only disadvantage of MF systems is the higher equipment cost, but recent technology advances permitted ISOMATIC to overcome even this problem and introduce the MIT line - the smallest and most efficient MF transformers on the market.